From the Heavenly Bodies: Fashion and the Catholic Imagination at the Metropolitan Museum of Art, including the mind-blowing rooftop installation by Hama Bhaba, to the super-hyped Takahashi Murakami at Galerie Perrotin, to the New Photography at MoMA with a vague but totally working concept, the choice is yours. The summer so far has a lot to offer for Art Lovers in New York. On top, our NY Editor Caroline Eleanor Absher got excited about the strong pair of female identifying artists addressing racism and social injustice at Chapter 249, rounded up nicely by the intense works by Zoe Leonard at the Whitney Museum of American Art. Regardless of faith, it’s hard to match the technical prowess, craftsmanship, and level of intricacy of religious artwork. Greek Orthodox Christianity has the grand, leaping mosaic vaulted ceilings of the Hagia Sophia (which were painted over when the cathedral was turned into a mosque after the city fell in 1453 — but small cracks remain, revealing the hand of an angel here or there), the ancient relics of fallen saints that lie in the corridors of San Marco Cathedral in Venice, and of course almost everything in Vatican City, Rome made under the direct patronage of the pope(s), not stolen from Constantinople. (theft is a part of it all, unfortunately). We can all agree that the incredible detail seen in the medieval wing of the Metropolitan Museum is unparalleled. ´Heavenly Bodies: Fashion and the Catholic Imagination´ ties this tradition of immense technical skill within the age old catholic canon to modern fashion. The contemporary world’s most accomplished designers and fashion houses have all referenced religious fashion through centuries of Catholicism, some twisting it eerily, sexually, sweetly. Each design in this exhibition — perfectly fit onto custom made mannequins, some standing zombie-like in formation, others hanging from the ceiling in chains, gazing down — demands a long look. The slowly building, epic orchestra music that fills the main room takes viewers to a different time — yet they are bound to the present by the Avant Garde. The haute couture pieces that fill the space are marvels of craft. Not only are they physically astounding, but many defy all laws of physics. 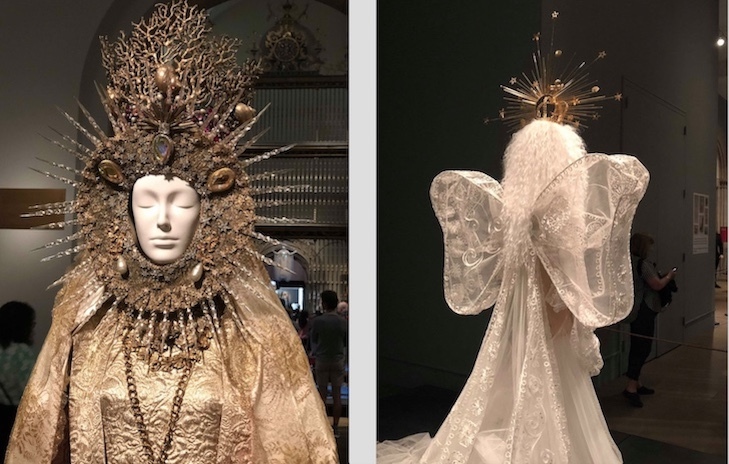 papal hats covered in heavy multicolored gems that seem to lightly rest on the head, wings in the shape of wooden space ships, wings made with tulle and thick bent wire, wings folded down in the guise of a long train — the word “heavenly” does not begin to cover it. I recently read an article titled “Murakami: Japan’s response to Andy Warhol”. Though I have personal thoughts on this, and deify Andy Warhol along with any other American, the article led me to take a closer look at Murakami’s work at Galerie Perrotin. Beyond any Warhol comparisons, the truth remains: Murakami has swept the world over. His extremely recognizable smiling flowers act in the same way any Yayoi Kusama colored dot would. In excess, brightly, wildly, and (most of the time) inoffensively. In his paintings lie charm married with darkness, pattern married with subtly complicated compositions, and traditional Japanese stylistic choices married with an “art star” workshop based approach to painting. 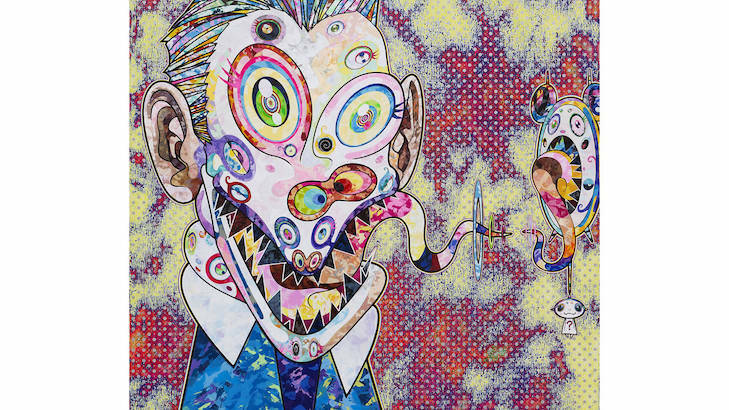 Takashi Murakami’s work is especially interesting here in New York. You can see here more than anywhere else (I believe) how his work is buried within the context of social media. I can’t think of another living artist who has flooded social media to the same degree, simply by existing, than Murakami. Each visitor in the gallery took endless photographs. It was like being in the swarm before huge works at the Louvre, waiting your turn for the envied central spot a few feet back from the work. His work is on T-shirts at Uniqlo, on the cover of Kanye West’s new album, at one restaurant, his flowers are branded onto hamburger buns, and he is used in several multi million dollar advertisements. Does widespread recognition based upon social media and commercial work like this devalue an artist, or give his name a few extra years of usage after he’s gone? I’m asking the hard questions because I constantly ask them myself. Andy Warhol is here to stay because he challenged pretty much everything about what it meant to make objects in the time he was making them. Seeing the hype of this show made me question what it means to make objects now, in an age of even more radical image consumption. And of course, social media related art is accessible to everyone, especially those who are not privileged enough to have learned the history of art or are able to see his work in person. While in New York, it’s definitely worth taking a look at this thought provoking show. MoMa has really outdone itself with the vague concepts here, but somehow, it works. While not all work is figurative, and some breaches abstract grounds, figurative photography is a nostalgic safe place. We love looking at it. We love creating it. There’s nothing more rewarding than seeing a human in a state of self awareness, in a place you’ve never seen, being able to find yourself in that stranger. I think that’s what the “search for humanness” line in the MoMa’s description of the show really means. Simplifying photography for one moment as it surges forward. As a medium, photography is constantly at a point where a thousand possibilities lie before it, like a giant branch sprouting from the ground. I am emotionally overwhelmed on a daily basis by how many photos are in the world. Imagine everyone that has an Iphone. Now imagine their iCloud storage with all their photos of cats and children. Trillions of rectangle little images swirling above our heads, how do we choose which are great? 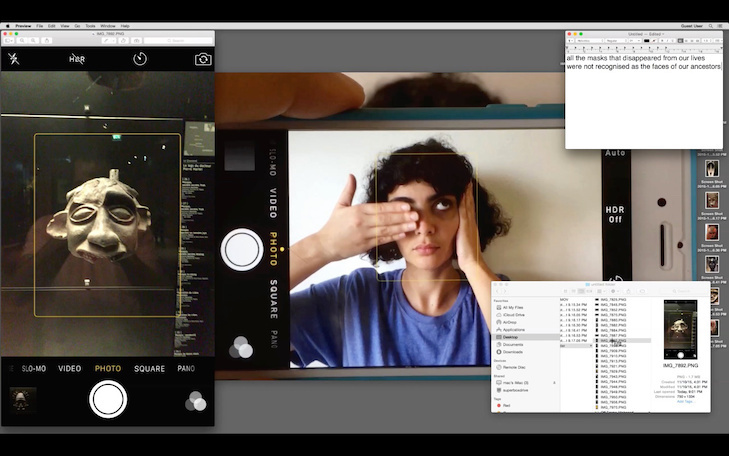 How does a curator with the theme “BEING” choose a few dozen artists that define that word? The truth is, as I walked the halls of this show, I realized that these photographers — while extremely diverse, talented, qualified, deserving of celebration — they are all of us. Both artists in this show are portraitists. One sculptural, one a painter. Both deal with the idea of individual/ shared trauma. Both take on what it means to have no voice/ a voice within marginalized communities. Racism, oppression, youth, memory, and coping mechanisms are all at play. 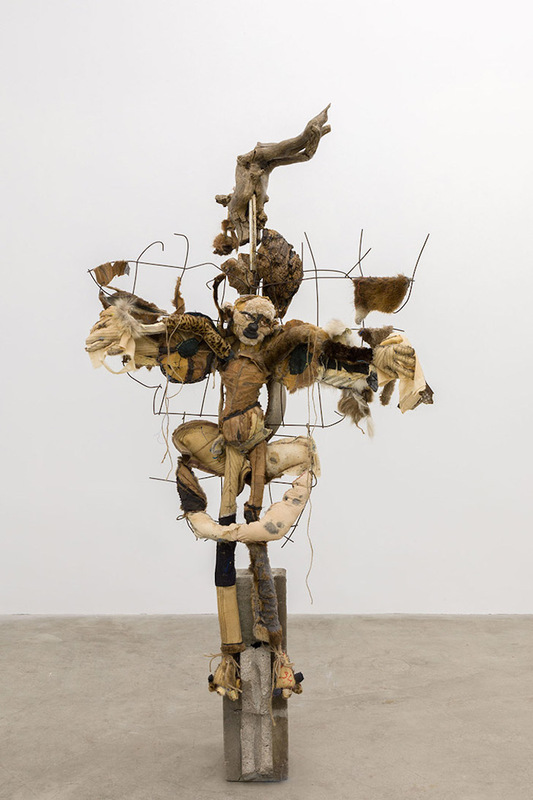 Lewis creates assemblage sculptures made from wood, steel, and found materials from the artist’s life create mannequin like totems of all of the physical embodiments of her past. They both pay homage and protect. Julien’s paintings are surreal abstractions of moments that defined her. “Night Session” is a piece in which the figure lies frozen in bed, aware but unable to move, as a disembodied hand reaches from above to swipe her body with a fat, thick brush loaded with bright, fluorescent paint. I was so excited to see a strong pair of female identifying artists addressing racism and social injustice with such powerful work. An incredible show. Zoe Leonard’s body of work was a show I wandered into, not looking for anything in particular. It’s multimedia, small, detailed, carefully placed pieces require a slow, quiet pace. 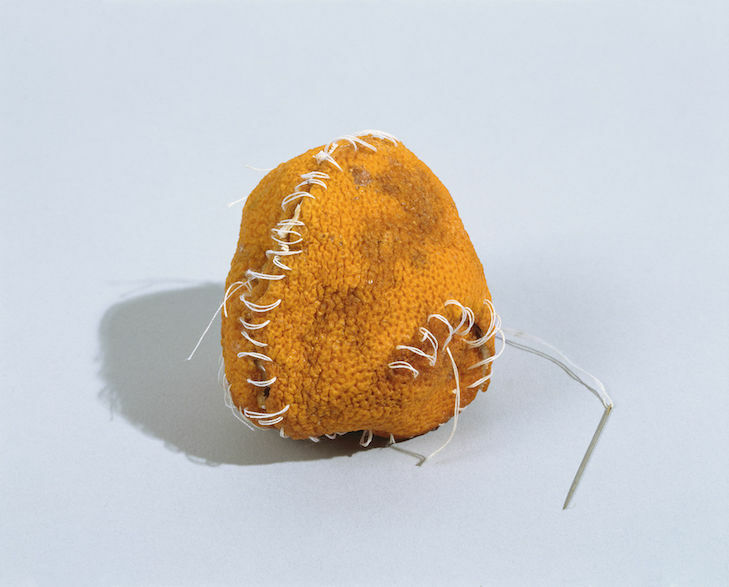 I was struck by the stitched together fruits, referencing racial injustices in America. Each fruit is decaying, old, grey, yet methodically stitched back together as though it could save anything. This body of work at the MoMa is well worth seeing.